Because we are a total transportation company no shipment is too big, too small or too unusual for us to handle. Whether it is a sensitive computer, a large machine component, or a corporate exhibit you can count on us to get it there safely and on-schedule. The Special Services Division ensures that sensitive products/trade show displays are handled solely by drivers and crews experienced in transporting your extremely valuable and delicate items. 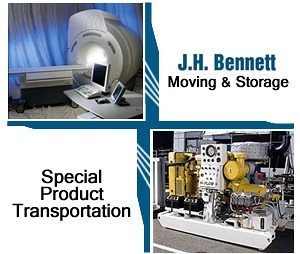 Medical and laboratory equipment, machinery, antique cars and even art exhibits all fit into this class of transportation services. In the case of moving your Trade Show Exhibit, you can trust our drivers to handle tasks in the marshalling yard efficiently, getting your display into and out of the arena on schedule. You will find United Van Lines representatives on hand at nearly every major trade show to assist with handling all the details. Computerized shipment registration, dispatch and van assignment functions – all of which contribute to best on-time service in the industry. 25% rebate if we do not deliver on the day scheduled! Expedited service at no extra cost! Coast-to-coast, Border-to-border in 7 days or less!